If you feel you show an excessive amount of gum tissue when you show a full smile (gummy smile), you may benefit from treatment at Stoner Periodontic Specialists. Our smile is perhaps one of the most important aspects of our appearance. If you are happy with your smile, it is easier to display confidence or express excitement. While if you’re unhappy with your smile, it can drain your self-confidence altogether and make social gatherings tough to involve in. When we think about an impressive smile, typically the teeth-shape, color, alignment, health and more is what comes to mind. While our gums, however, are an incredibly important part of our smile as well. If you unintendedly show too much gum when you smile, it can make your face appear longer or make your teeth seem smaller. 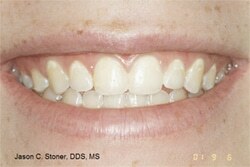 The proportions of your smile could be adjusted to allow a more uniform look. Our professionals can enhance your smile with crown lengthening or crown shortening in one of our offices in Columbus, Ohio. Our crown lengthening and shortening procedures are painless solutions for developing the smile of your dreams. If you are concerned about the amount of gum that you show, or the size and shape of your teeth, contact our office for more information about this treatment. These procedures are usually quick and easy and provide immediate results. Check out our before & after photos listed below to see just how effective these treatment options are! Excessive gums, more commonly known as a “gummy smile,” can be treated fairly quickly and painlessly. We use a process called a Laser Therapy treatment that provides our patients a comfortable procedure. 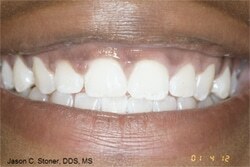 Our specialists will first examine each patient smile to determine the extent of the gum tissue. A digital or traditional form of an impression will also be taken to fully determine what needs to be done. An x-ray will also be administered to every patient so the imaging can show any unhealthy bone or tooth roots that cannot be examined with the naked eye. This examination is needed to ensure the patient is healthy and has a good amount of healthy jaw bone/ tooth roots available for the procedure to be performed. The best results start from an extensive planned out journey. The laser is pointed directly at the excess gums for removal. The laser does not produce any heat or vibration, therefore making it a painless and easy treatment. The laser will also seal up all blood vessel instantaneously resulting in less bleeding or swelling. During the crown lengthening procedure, excess gum and bone tissue are reshaped to expose more of the natural tooth. A light mist of water will keep the whole procedure smooth and steady. Sutures are placed to replace the gingival tissue around the tooth, and a band-aid material is placed around the tooth to allow the gingival tissue to heal correctly. The crown lengthening and crown shortening procedure can be done in a matter of minutes. Full healing time is usually expected to be completed in only a few days if the gum area being treated is minimal. If there is advanced treatment needed, the healing can be a few months. It is not necessary to adjust your activity level or changing your diet in order to quicken the healing process. Patients who are unhappy with their gummy smile can be candidates for this procedure. A development of excess gum tissue or even uneven gum tissue can negatively affect a person’s smile. Our professionals will reshape (also known as gum contouring) your gum line to shorten the excess gum tissue and increase the length of your teeth. With such a painless and easy treatment available, we are happy to provide this procedure to the locals of Columbus, Ohio. 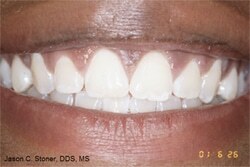 The only major requirement for this procedure is to ensure the patient has a generally healthy smile. Before local anesthesia is administered, the patient must be sure to communicate with the professionals of any allergies to medication prior to the treatment. 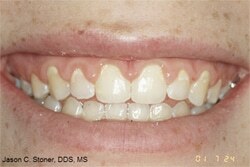 While it may seem merely an aesthetic issue, patients with a gummy smile may have an underlying issue as well. A gummy smile may be caused by how the jaw bone was initially developed. If the upper jaw bone bulges out more than how it normally does, it can appear to give someone a gummy smile. While this isn’t something that can be initially prevented, it could cause an improper bit and possibly affect long-term health. Another reason as to why a gummy smile occurs is if the patients have an overactive upper lip. The muscles associated with this part of the mouth may pull the upper lip higher than where it normally should go. While this doesn’t necessarily mean a patient has a gummy smile initially, it can give the illusion that the person does. Nonetheless, this can be treated with this type of procedure. Your dentist may refer you to visit Stoner Periodontic Specialists for a crown lengthening procedure for a various amount of reasons. Usually, this procedure is needed if there is an excess amount of gum tissue present and the patient is interested in correcting this for aesthetic reasons. If the patient has a tooth that is decayed or broken below the gum line, it may benefit from gum recession to allow more space for treatment options. If a tooth has an insufficient tooth structure for a restoration or crown, this procedure will allow more space for a fabricated tooth restoration piece to be cemented onto the tooth. If you are interested in learning more about how to treat your gummy smile with our crown lengthening and crown shortening procedure, contact our office via phone or our online Contact Form. We have trained, professional staff standing by to answer all of your questions. This procedure will boost the confidence in your smile as well as improve your periodontal health. Call Stoner Periodontics at (614) 392-7384.